I love books that are set around mythology and this one was especially cool, because it incorporated all different types of mythology, not just the currently popular greek mythology. Gwen's magic, psychometry, was really cool and maybe a little scary. Being able to know details about someone or something just by touching it would be crazy intimidating for me. Gwen handled it by mostly ignoring people. Of course, as with any good story about a magical loner, you never get to stay invisible and alone for long. 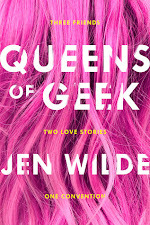 As Gwen starts investigating what really happened to Jasmine Ashton, she has to enlist the help of mean girl Valkyrie Daphne, but we start to find out that there might be more to Daphne than her mean girl antics. Honestly, I didn't like Logan at first, he was too cocky for me, but he definitely grew on me the more he popped up in the story. All I want now is to learn all of the secrets he swears Gwen doesn't want to know. Cocky guys bother me to no end, but mysterious and cocky guys get my full attention! There is so much craziness going on in this world with all of the different Gods and mythologies, and the Chaos War with Loki and his Reapers. I don't know about you, but being at the center of a war between good and evil Gods, seems like the most dangerous place you could be. Mythos is a place were all these warrior kids learn and hone their skills and are seemingly protected from bad things, but not everyone there is on the side of good and figuring out who is the enemy doesn't seem too easy. The mystery in this one wrapped up nicely, as far as Jasmine's death and everything surrounding that, but there are plenty of things that just had the surfaced scratched and I can't wait to find out more. 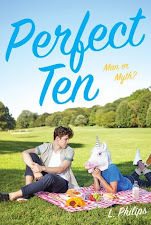 This was a phenomenal read with plenty of action and wit. Vic is the best kind of comic relief! I would definitely recommend this to anyone who likes mythology, weapons, magic, boarding schools, badass warriors and hoodies :0) Also, I would like pink sparks to come from my fingers, that is all. I loved this one too and can't wait for the second one. The pink sparks thing is pretty cool. Great review. Thanks for the review. 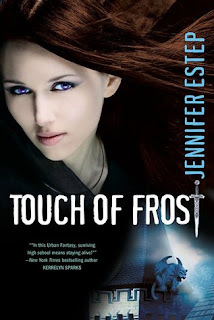 I've been thinking about checking out this series for a while, because I love Jennifer Estep's Gin Blanco series (UF) -- Think I'll add Touch of Frost (and the rest of this series) to my TBB (shopping) list!